Paper scrapbook albums come in many sizes, textures and colours. What type is best for your project? "Life is Simple...Eat, Sleep, and Scrapbook"
Paper albums have probably been around for centuries. There are many varieties of them available to buy, but you can always custom make them yourself. How heavy will the pages be altogether? This will determine the strength of the pages you might need, (the weight of the paper in other words). It will also help you choose a cover. For light, thin paper albums a cover can be correspondingly light and thin, and vice versa, though it is probably best to make a stronger cover for albums with thinner pages purely to protect them better. How long do I want this particular paper scrapbook album to last? If it is a temporary project, I can choose material that is not as durable as paper I would choose for a heritage album, for example. Did you know? acid free, lignin free and buffered Archival quality paper can last for 100 years or more! How much will my album be handled? Do I need to cover the pages with protectors? Do I need to mail this album? How bulky and heavy should it be if I post it? Albums can be custom made by you (or others) to suit the projects you have in mind. See how to make Paper Bag Albums, for example. As another example, I made a Circle Journal by having heavy card cut to a 6" x 6" (15cm x 15cm) size. This was a good size for mailing the Circle Journal to all the participants in the project, though it was not a standard sized album. A stationer cut the pages to order for me. You will consequently find paper and embellishments made to fit the standard sizes. This makes it easier to create pages quickly and conveniently. You will find albums that are both larger and smaller than the standard sizes I have listed. Some scrapbooks are made entirely of chipboard and are not paper at all. There are albums made of leather, fabric, polypropylene, and many other mediums. Of course, as a creative papercrafter, you will find you can adjust pre-made embellishments and paper to fit albums that are not a standard size, and have a lot of fun doing so. You may already have made albums of your own. If you have, I would love to see what you made! 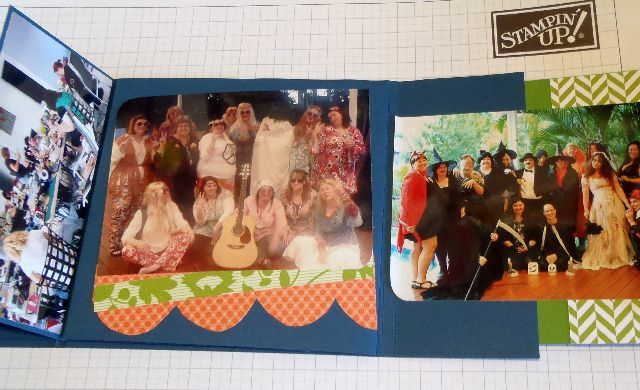 Send me a photo or two of your paper scrapbook album (the cover and a page or two would be great!) and tell me why you made a photo album yourself. I think the stories behind our albums are so interesting and are part of the creative process. PS: If you like to use Stampin' Up! products in your scrapbooks, you may like to join Sharon Dalton's Scrapbooking Global group on Facebook. There is such great inspiration there!